The Monk Parakeet is a second species of parrot to establish itself in the UK, however, it has not established itself to anywhere near the degree of the Rose-ringed Parakeet. It is found in a small number of locations around the London area with the one particular colony I'm aware of being at Mudchute farm. To my knowledge, they haven't spread much. They are however, soon to be subject to a removal program on the grounds of potential damage to infrastructure, native species and crops so if you wish to see them best to go looking soon. 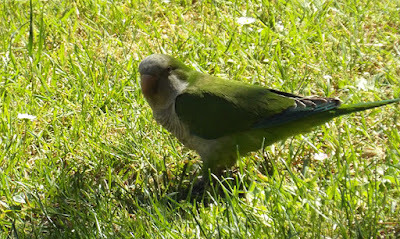 In Spain however, they are locally abundant - in Madrid they are one of the most common birds seen on a day to day basis. - A few birds seen at Muchute Farm in May 2012. SPAIN - Locally abundant resident. - MADRID 2015 TRIP: Seen daily in park areas of Madrid. - MADRID 2016 TRIP: Seen over El Pardo.